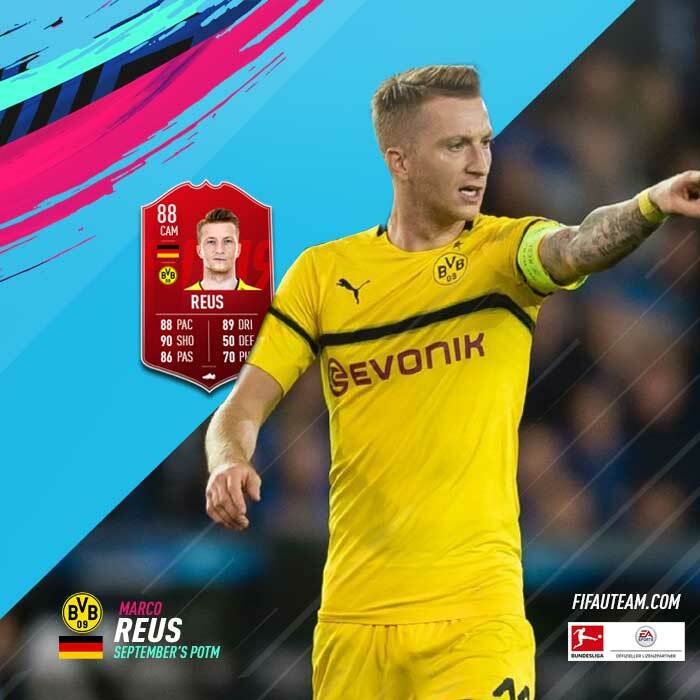 In this page you can find everything about the FIFA 19 Bundesliga Player of the Month, including the contenders, nominees and winners of each month, their new FIFA 19 POTM cards and the respective squad building challenges. The official “Player of the Month” award is being introduced to the Bundesliga for the first time. 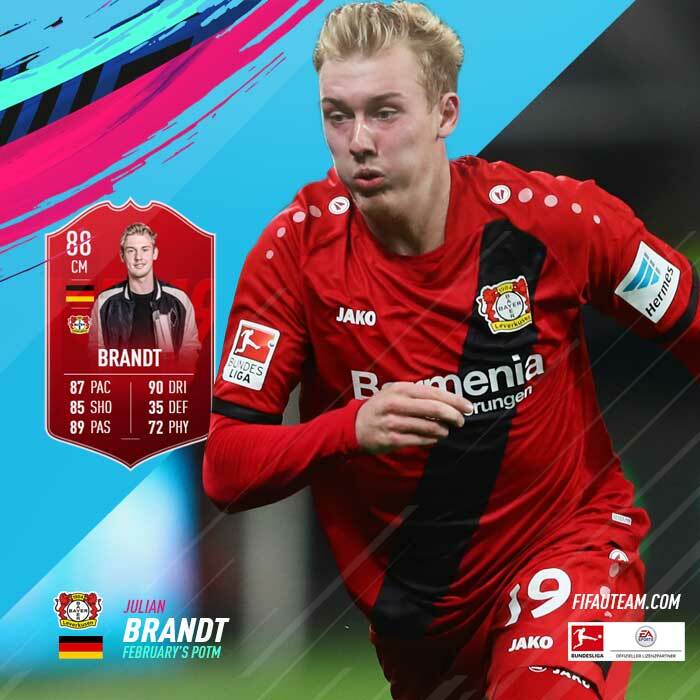 The new award has been created by DFL Deutsche Fußball Liga in cooperation with the Bundesliga’s official licence partner, EA SPORTS FIFA 19. It will be awarded in a two-stage selection process that will consider both the players’ individual performance data and a vote by fans and experts. The winner receives a FIFA 19 POTM card with boosted stats. Usually, EA also releases a new squad building challenge around the player of the month. Lewandowski’s March efforts are remarkable but they aren’t unrivalled; Werder Bremen captain Kruse also notching six goals in four games over the course of Matchdays 24-27. The 31-year-old has also contributed three assists. It is a stunning improvement for Kruse, who had scored four times in 23 appearances prior to his March heroics. Even given his own ridiculous Bundesliga scoring record down the years, it is safe to say Lewandowski has hit top form in March; netting six goals in just four league matches. No player has scored more this month, with the 30-year-old on the scoresheet in each of Bayern’s three wins against Borussia Mönchengladbach, Wolfsburg and Mainz, as well as the draw against Freiburg. Only Lewandowski and Kruse scored more in March and James trumped the two in terms of efficiency in front of goal, scoring with every 2.5 shots and converting the only key chance he was given – the best ratio among the unerring trio. In addition to his goal record, the 27-year-old stood out in his usual role as both Bayern ball magnet (on average, he touched the ball 92.8 times per 90 minutes) and pass machine (255 passes per game, completing 87 per cent of them). In Hütter’s 3-4-3 system, Kostic’s role is pivotal both in adding width to the side and also tracking his opposite number the other way. Offensively, the Serbian international has registered a league-high 119 crosses, creating 11 clear chances for the likes of Ante Rebic, Sebastian Haller and Luka Jovic to feed off. Werder enjoyed a superb run in March, but captain Kruse was not alone in making it happen. 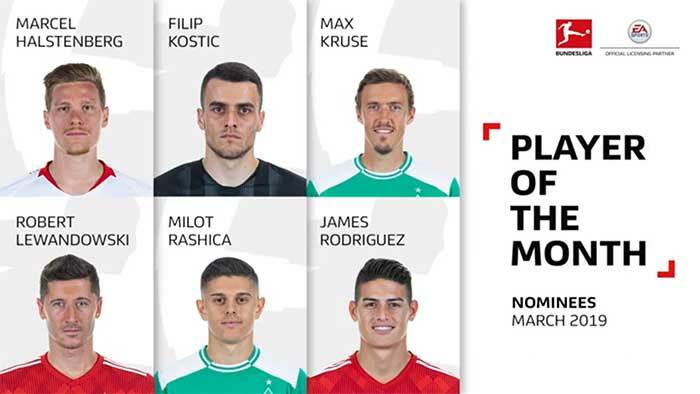 Erstwhile attacking partner Rashica also pushed him hard for Man of the Match awards week on week. Like James, Rashica scored four goals in as many March matches and the Kosovo international is now delivering the kind of consistency that Bremen fans dreamt of when he signed for the club in January, 2018. In March, Halstenberg showed off yet another of the many strings to his bow, proving he is as good defensively as he is offensively. Leipzig managed four clean sheets from four this past month, with Halstenberg a key component in shutting out their opposition. Halstenberg won 70 per cent of all challenges, while the 6’1” defender was dominant in the air; winning 81 per cent of his headers. The 23-time Germany international has been thriving under new coach Peter Bosz, though, and no Bundesliga player had a hand in more goals than his six in February. As well as notching a brace in the 5-1 dismissal of Mainz, he provided four assists in four games, another league-high mark for the month. 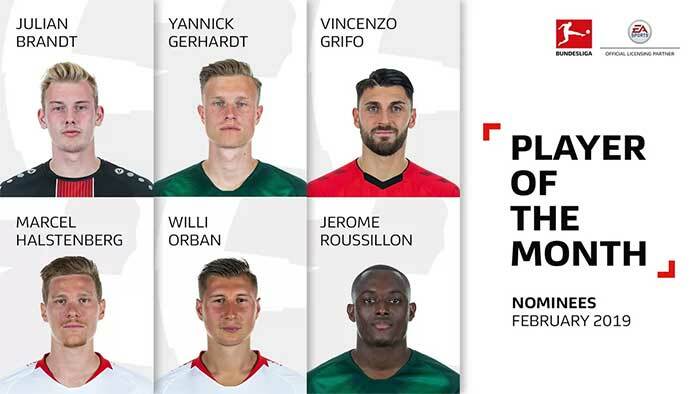 It was an excellent February for both player and club, with Gerhardt also grabbing an assist against Mainz (3-0) – and not shirking his defensive duties as Wolfsburg kept three clean sheets in four games. Vincenzo Grifo looks a man transformed since returning to Freiburg in January on loan from Hoffenheim. Having managed just one goal and two assists for TSG throughout the entire Hinrunde, the 25-year-old had a hand in more goals for the Black Forest club in February alone, with two goals and two assists. He also made more Bundesliga starts last month (4) than during the whole first half of the campaign (3). In February, Halstenberg teed up no fewer than 12 goalscoring chances, more than any other defender in the division. He provided two assists for captain Willi Orban and showed that he is not afraid to step up and take responsibility by converting his first Bundesliga penalty against boyhood club H96. With three goals in four outings, Orban was even the Bundesliga’s most prolific player in February. The Leipzig captain is a man for opposition defenders to keep an eye on if he is roaming around their penalty area. Making no secret of his desire to become a senior France international, the pacy 26-year-old has been a constant menace, starting all but two Bundesliga games – for which he was ruled out by injury. He stepped things up a gear during a fine month of February, playing the full 90 minutes in Wolfsburg’s four games, conjuring up a goal and two assists, and creating more scoring chances (9) than any of his teammates. It’s easy to see why Leon Goretzka’s name figures among the six candidates: with three goals, the Bayern Munich midfielder is January’s top-scorer. 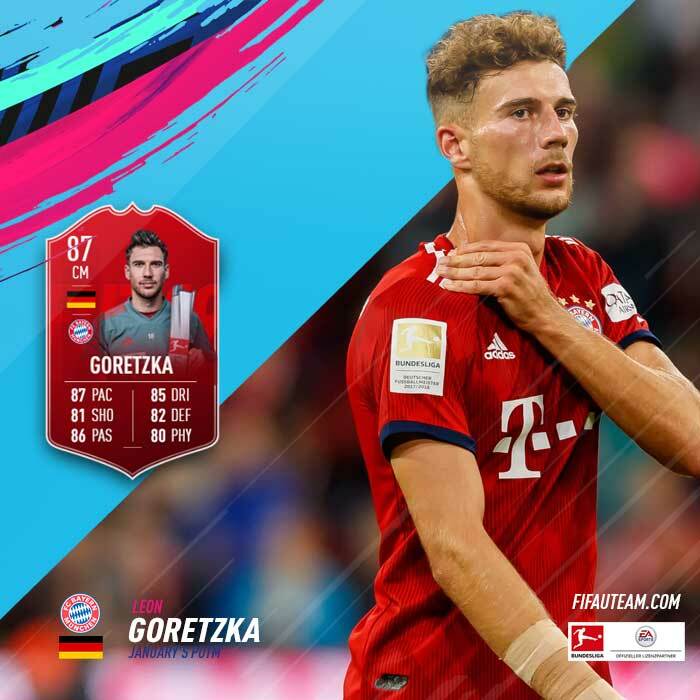 One of the reasons for this newfound goalscoring threat is undoubtedly his move into a new role as a number ten, which Goretzka fulfilled for the first two games of 2019 in January. The Portugal international, who was signed as a right full-back and shone under Thomas Tuchel in the centre of midfield, showed his goalscoring ability in the UEFA Champions League this season with four goals making him the club’s top-scorer in that competition, and on Matchday 19 he was finally able to celebrate his first Bundesliga goal of the 2018/19 campaign. With his third and fourth goals of the season, Caligiuri is now Schalke’s top scorer, even if frequently the Royal Blues adopt a back three which sees him push forward into midfield. His shooting precision and heat-seeking delivery of set pieces are not all Caligiuri has in the locker, though. With 42 successful challenges, he was also the Bundesliga’s top tackler in the month of January. Hertha’s playmaker now has nine goals to his name after 20 Matchdays and is thus the Bundesliga’s second-most prolific midfielder behind Marco Reus. His three direct involvements in a goal in January is also a Bundesliga high for the month, while he helped ensure that Hertha – for the first time in nine years – picked up four points from their first two games of the second half of the season. The ever-reliable right full-back has been getting more and more involved in his side’s attacking play and in Dortmund’s tricky 2019-opener at RB Leipzig, he supplied the assist for the decisive winning goal from Axel Witsel. It was already his fifth assist of the season – his best return in six years. With four shots on goal in January, only Guerreiro had more for BVB in the first month of the year. The Mainz right full-back has been an absolute banker. With the exception of a two-week injury break at the start of the season, Daniel Brosinski has been on the field for the duration of all of his side’s matches. With a total of five assists this season, Brosinski is Mainz’s best goal provider this term. In December, Reus scored in all three of Dortmund’s home games. In addition, he made the opening goal in the Revierderby win over Schalke. With six assists in total, no one has been directly involved in more goals (17) this season. David Alaba played a decisive role this month. The Austrian with the great left foot was a constant in the record champions’ team during this period – starting all five matches. Gerhardt didn’t miss a minute of action in December, and he was usually one of his team’s top players. In the 3-2 win in Augsburg on Matchday 17, the Cologne midfielder even got the winning goal – his first in 2018. In December Kimmich played three times in central midfield and twice at right-back, providing three of his seven assists in that month alone. His best game was in the 4-0 success against Hannover, when scored his first goal of the season, made another, and also played a part in the other goals. The 30-year-old scored two goals himself and made two more in the final five games of the year. In total, Kruse was involved in 37 attempts on goal in December – more than any other player in the Bundesliga. In December alone, the 30-year-old scored three goals and made one more. On Matchday 14, in the 3-0 win over Nuremberg, Lewandowski scored more than one goal in a Bundesliga game for the 50th time. Only Gerd Müller (87 times) and Jupp Heynckes (51) managed that more often. Marco Reus will always be the first player to win the Player of the Month award after picking up the inaugural honour in September, but it surely won’t be the last the Borussia Dortmund captain claims. His month’s efforts in November certainly put him in strong contention: three goals in three games — as well as an assist — meant the Germany international kept the league leaders rolling at a stunning average of three goals a game. A striker’s main job? Scoring goals! Haller did exactly that for Eintracht Frankfurt in November. Three games played, three goals scored. Strong, fast, and with an acute sense of being in the right place at the right time, the Eagles’ No.9 scored every time he played, making him the league’s leading marksman over the period. If the ‘other’ Borussia are Dortmund’s closest challengers at the top of the table heading into December, Hazard has a lot to do with it. The Belgium international has been a consistent performer all season long: three goals and an assist in September, two and two in October. November saw him involved in at least one goal every game, finding the net once himself and teeing up another two to maintain his central role in his side’s success. His November tally of two goals and as many assists only looks ordinary when compared to the six strikes and single assist he notched in three extraordinary Bundesliga games in October. Along with Haller and Borussia Dortmund’s Paco Alcacer, the 20-year-old ended the month on top of the Bundesliga’s scoring charts with nine, a total collected in just ten appearances. If how quickly a new signing can settle in is a gauge of their quality, then Alassane Plea must be of the very highest calibre. The stats since his summer arrival from OGC Nice have backed up that suggestion, and he polished them up with an impressive month’s work: three games, three goals, one assist. That helped him earn a first-ever senior international cap with FIFA World Cup winners France, and took his Bundesliga tally to eight in his first 12 league outings in Germany. You cannot have Haller and Jovic without Rebic, so entwined have the trio’s talents and achievements been this season. The Croatia international’s World Cup exploits meant he joined Frankfurt’s party a little later than his partners-in-goals, but November saw him hit the ground at full pelt. Two goals and an assist in the month took him to five strikes and two assists in just eight appearances this season. At just 18 years, seven months and two days old, BVB’s latest gem became the youngest player in the club’s history to notch two goals in a Bundesliga game. He also wrote his name into the history books as the first player born in the 21st century to bag a brace in the German top flight. The 20-year-old enjoyed a historic night as Frankfurt put seven past Fortuna Düsseldorf on Matchday 8, becoming the 15th player to score five goals in a Bundesliga game – and the youngest to boot. The Serbian now averages a goal every 88 minutes in the top flight, which is an all-time record for players with at least 25 Bundesliga appearances. Jonas Hofmann has been enjoying a new lease of life since Dieter Hecking shifted him from the wing to a more central No.8 role. The 26-year-old had a hand in no fewer than five goals in October, kicking off in formidable style with two assists against Bayern Munich – which paved the way for his side’s sensational 3-0 win at the Allianz Arena. The Frenchman has seized the spotlight again at Frankfurt this season; with no fewer than six goals and five assists, he’s had a hand in more goals than any other player in the Bundesliga. The 24-year-old has started seven of nine games for the Eagles under new coach Adi Hütter, and a season of bedding-in appears to have improved his uncanny ability to unlock Bundesliga defences. The 27-year-old played every single minute in the Bundesliga this month, creating six major goal-scoring chances in three games, as well as providing Leipzig with a considerable attacking thrust down the left flank, Halstenberg ensured that his side remained rock-solid at the back, contributing to three clean sheets in as many outings. The Black-Yellows have torn opposition defences to shreds with their devastating pace, and nobody has better illustrated their fleet-footed menace than full-back Achraf Hakimi. The Morocco international has even clocked the top speed in the Bundesliga this term: a blistering 21.5 mph. The Real Madrid CF loanee played every minute in the league in October, making a sizeable contribution at both ends of the pitch. Players who had partially completed this SBC when it was removed have had the items they submitted returned to their club. 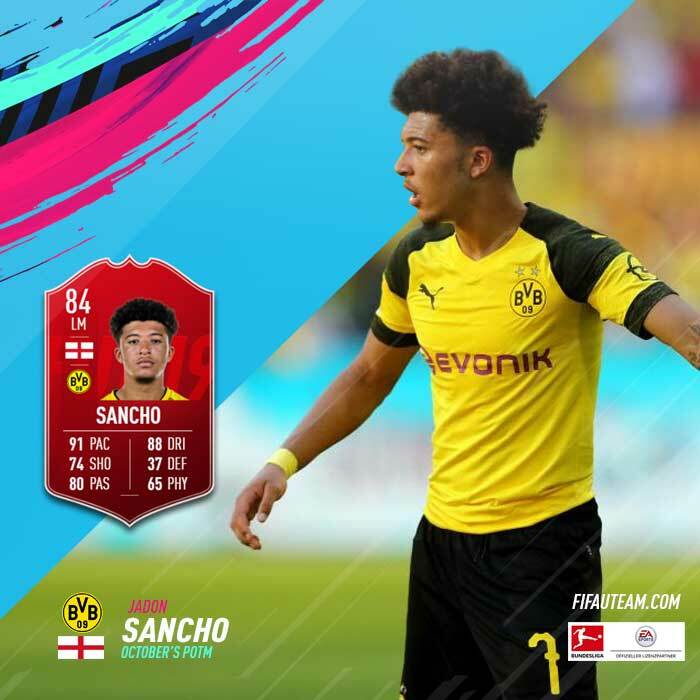 Players who completed the SBC will be granted a new version of POTM Sancho and will be able to keep both. Since November 19, the SBC reward is a RM Sancho card and not a LM item like it was initially released. Borussia Dortmund is finally back where their fans wish to see them. 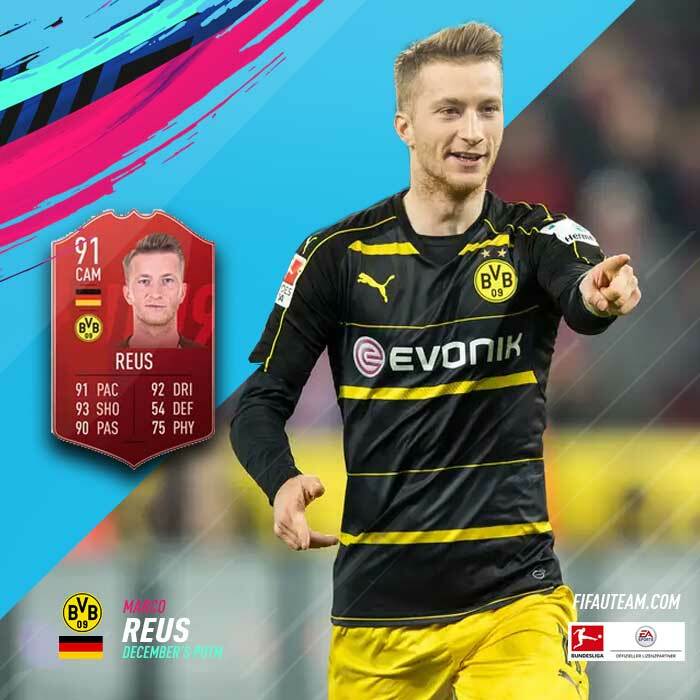 The Black-and-Yellows’ attacking display saw them claim top spot in the Bundesliga table, and that was in no small part down to their captain, Marco Reus. Hertha Berlin have had their best ever start to a Bundesliga season with 13 points from their first six games. And that upturn in the capital is closely linked with one name: Ondrej Duda. The 23-year-old has been Hertha’s leading light in September with five goals in as many outings. After a breakthrough season last year, Thorgan Hazard has raced out of the blocks for Borussia Mönchengladbach this term. The Foals have made a superb start to the season, and the Belgium international is proving more important than ever in the Borussia attack. With 10 point from five games, Werder Bremen can be pleased with their September haul. 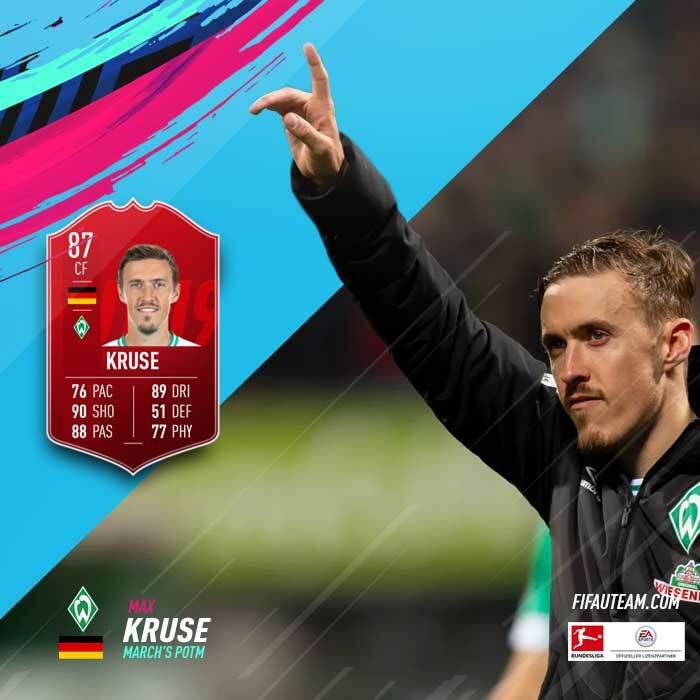 And that return is in no small part down to the performances of their captain, Max Kruse. An out-and-out centre forward is what Borussia Mönchengladbach fans and staff wished for ahead of this season, and they have found that in the shape of Alassane Plea. The summer signing from Nice in France was immediately thrown into the deep end at Borussia because of injuries, but he has done much more than simply tread water. RB Leipzig got off to a slow start this Bundesliga campaign, but September saw Die Roten Bullen unleashed – and that was also the case for their striker Timo Werner. The Germany international took some time to get going this season, however, he has looked more and more the part once again with each passing game. when is hazard POTM comming out ? 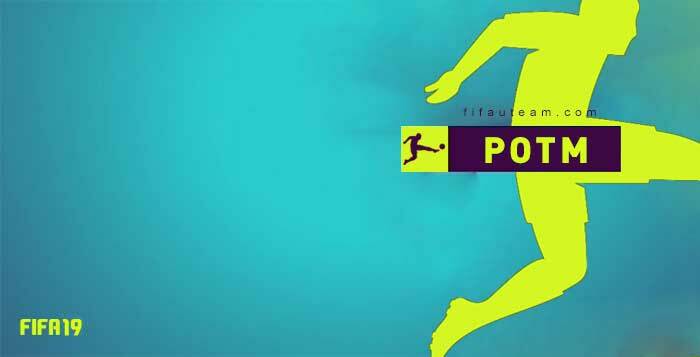 We believe that Bundesliga POTM winner will be announced on December 14. What happened to Sancho sbc? Updates?? POTM Jadon Sancho SBC has been removed and will be republished with updated rewards in the near future. Requirements for this SBC will remain the same. You will get all the players you’ve submitted into the SBC back (if you didn’t complete it). If completed, you’ll get the RM item as well. When comes the potm out? IT was released Friday at 3pm. Hello, do someone knows when the POTM sbc comes out to FIFA and when the POTM is presented ? Sorry for the late response. It was announced last Friday. timo werner plays in m’gladbach?